Boost moisture minus the heaviness with a gel moisturizer from L'Occitane, The Body Shop and Avon! L'Occitane Hydra Vital Gel - 50ml - $42 - with a light gel texture that melts into the skin for an instant thirst-quenching effect making it ideal for normal to combination skin to get 24 hour hydration for skin that looks fresh and radiant without feeling weighed down or greasy. Contains organic angelica water - to boost the circulation of water in skin cells; organic angelica essential oil - to protect skin against free radicals and improve the elasticity of skin fibres; and angelica seed extract - to better deliver and retain moisture for a long-lasting, balanced level of hydration. Available at L'Occitane boutiques across Canada. The Body Shop Vitamin E Aqua Boost Sorbet - 50ml - $20 - aquasphere technology offers deep hydration - microscopic moisture spheres that act like tiny reservoirs and hold hundreds of times their weight in pure water; along with wheatgerm oil and Community Fair Trade shea butter and soya oil - combines for a burst of refreshing coolness in a velvety soft, feather-light texture - while mineral particles help to absorb excess oil and mattify leaving your skin shine-free and fresh. Available now at The Body Shop stores and online at www.thebodyshop.ca. 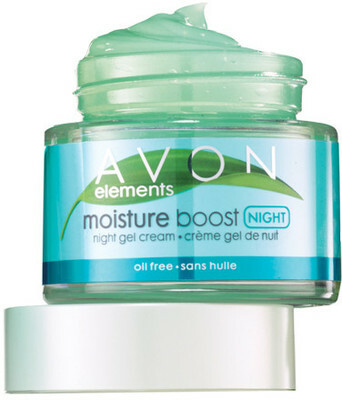 Avon Elements Moisture Boost Night Gel Cream Oil-Free - 50ml - $12.99 - a lightweight gel cream that helps skin feel more balanced, while looking and feeling smoother and nourished. I love the new Body Shop Vitamin E sorbet. It is perfect for a hit of hydration without the heaviness of a cream. Great picks!